The changes that have come from the music industry's latest coming of age during the past ten years have been nothing short of extraordinary. For many of today's artists, the challenge of learning how to manage, promote and book shows is something that they have been learning to navigate while remaining focused on what has brought them to this point in the first place: the art of creating music that reflects their lives, beliefs and observations and that resonates with audiences in a meaningful and sustained way. Brooklyn-based band SkinGod has been successfully facing these challenges for the past three years. For vocalist and guitarist Ronnie Shingelo remaining connected to the purpose behind the music has been deeply instrumental in how he presents it. "I'm mostly attuned to audience's responses to the material and it puts me in a more grateful space to be able to share it. I feed off of what people are responding to and then, I can deliver more and open my heart more," he begins. "As time goes on, I'm finding it to be the most important thing- the human connection." He relates his own performances to how he has often felt while standing on the other side of the stage, out of the spotlight. "When I go out and listen to bands, the first thing I am looking for is some sort of connection. I question what is this all about? Is it about you as a performer up there for your own personal reasons or is it really about trying to share something in terms of a bigger picture and message? I think it reveals itself really powerfully one way or another." Shingelo concludes, "the only way we can survive as a band and with music that need to be heard is to be as open to be possible." 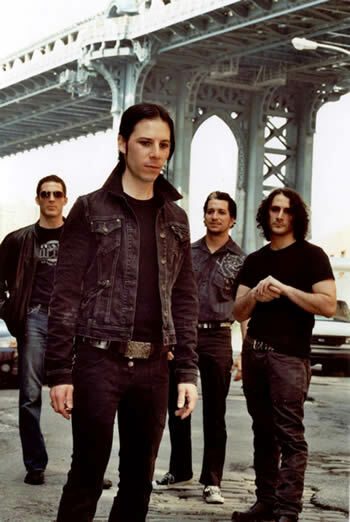 SkinGod formed as a band in 2005 when, synchronistically, both Shingelo and long-time friends drummer Matt Bellardinelli and guitarist Tommy Binasco posted notices on Craiglist seeking a band and a singer respectively during the same week. "I had been playing solo for a number of years and decided that I wanted to put a band back together. As it turned out, we were all looking for the same thing at the same time." The incarnation was complete with the addition of bassist Adam Scott in 2007. SkinGod released their first EP, Frailty, in May 2008 and are currently working on the follow-up, Pale, which is due to be out in late Fall 2008. While Frailty is mostly comprised of older songs written by Shingelo that were re-worked as SkinGod took shape, Pale will also include new material that was created as a band. "There are two songs on the new one that will be remakes with SkinGod. Three of them are completely new songs that were written more as a band and were influenced by playing together in a room, so they have a different feel," Shingelo explains. The choices of the songs on Pale reflect a specific moment in time. "The lyrical content is very much of right now and of what we feel is a message that could be revealed in terms of a particular time and the fact that we're still at a war that should never exist. The theme is how I feel about that and about the reality that lots of families have had to deal with because of such a tragic thing is happening still." The melodic and definitively rock sounds of SkinGod are balanced by Ronnie Shingelo's soaring and often other-worldly vocals that evoke comparisons to Jeff Buckley and Jimmy Gnecco. "I'm floored when people think that. Jimmy is a vocal genius and I love all that he does with OURS. He is probably one of the top singers in the world and not just in my opinion, so even to be put in the same conversation with him is something I am humbled by." Shingelo studied in Nashville with noted vocal instructor and musician Brett Manning. "He really taps into amazing things and took me to places I never could have imagined vocally. He influenced my realization of the fact that it is a gift to be able to sing and express oneself and taught how to preserve that and treat it with respect." Indeed, through their dedication and strong work ethic, SkinGod has begun to receive more and more attention and in the summer of 2008 advanced to the final round of the international battle of the bands, Emergenza. "We took fifth place in the finals, which is a really cool thing and the song Ghost was selected to be on their world compilation CD, which was a real honor. Out of 4500 bands competing internationally, they only selected twelve songs and Ghost was one of them," says Shingelo. But, just what is a SkinGod? Shingelo reveals the meaning behind the name, "They are what make up who we are: loves, losses, joys, traumatic experiences, anything that has a positive or negative effect on you in your life that has caused some sort of effect to you. And, these are the kinds of things that I try to talk about in the songs--- anything from love, and joy to addiction and loss." And, undoubtedly living in NYC has offered no shortage of inspirations on these topics. "It's certainly an influence because there is so much going on here. All you need to do is walk down the block and there are fifty songs to be written about what you just experienced." Interview originally appeared in IndieSoundsNY (Issue #36 September 2008).